Can you treat it yourself with homeopathy? Would you like to feel confident to treat family health problems yourself using natural homeopathic remedies? There are many situations in which you can easily treat family injuries and illnesses yourself with homeopathy. This post aims to teach you the basics of when and how to do this and I hope that by the end you will feel ready to have a go. For what problems can I self-prescribe homeopathic remedies? It is entirely appropriate to use homeopathic remedies yourself at home for minor, self-limiting illnesses. These are illnesses from which you would expect to recover fully but you would like to speed up the process. You may well find homeopathic remedies particularly useful for minor injuries and for common children’s infections. When should I seek help from a homeopath? It is however important to know which illnesses you should not attempt to treat yourself and also when to seek help if self-prescribing isn’t working well. Remember that there are many more remedies available to a qualified homeopath and in complex cases it takes experience to decide on the best treatment and to monitor progress. One of the fundamental principles of homeopathy is to use the “minimum dose”, that is to prescribe the fewest number of pills necessary. This applies both to professional prescribing and to using remedies at home. Always ask yourself if a remedy is actually needed at all – it may well not be for a mild cold, for example. Also, always stop giving any further doses once improvement is under way and then only give another one if this progress stalls. To choose the most appropriate remedy consider the detailed symptoms you want to relieve. Look at the patient’s mood as well as their physical symptoms and also be alert to anything else at all that is different from normal for that person. Consult a list of remedies and the symptoms for their use and pick the closest match. You can find such information in books, online or in the leaflet that accompanies many homeopathic first aid kits. I will also be adding more topics in the “Treat it Yourself” category of my blog. For example, look at my post on preschool separation anxiety. In the section on remedies to try yourself, you will see 4 possible remedies listed and a description of the child for whom each of these would be appropriate. 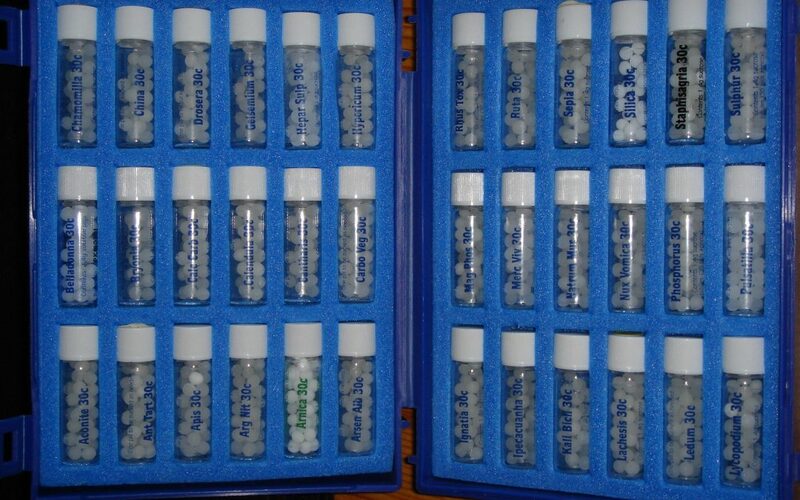 Homeopathic remedies are identified by the remedy name followed by a number. The number indicates the strength or potency. For home prescribing 30c or 6c are the most suitable potencies. Some basic remedies can be bought in high street pharmacies and health food shops. For a wider range, I recommend Helios homeopathic pharmacy who will take orders by phone and post remedies to you. They can also supply kits of remedies for home prescribing. Take the first dose of the remedy by simply sucking it. Ideally it should be taken 15 minutes away from any food or drink but in an urgent situation dont worry about this. Watch for improvement. For most home prescribing you can repeat the remedy 2 or 3 times a day for 1-2 days but always stop as soon as clear improvement occurs. You may only need 1 dose. If 5 doses has brought no improvement, ask yourself if another remedy might be a better match and seek help if you are not sure. I hope you now feel inspired to try some home prescribing for minor illnesses or injuries. It can be very rewarding to be able to look after your own health and that of your family in this way. Have fun with it and watch your confidence grow. To receive my email newsletter with information on my homeopathy practice, news and tips, sign up here. If you have further questions, please feel free to get in touch.